Even today many rate Soviet player Lev Yashin as the greatest goalkeeper in the history of soccer. Nicknamed “The Black Spider” for his incredible agility and trademark black jersey, Yashin won numerous titles, yet never lost his common touch. Here several of Yashin’s colleagues and teammates share their memories of the great Soviet goalie. In the 1990s, FIFA named great Soviet goalkeeper Lev Yashin the best of the 20th century. He, together with Pele, Maradona, Beckenbauer, Bobby Charlton, and Eusébio, became part of an all-time world team selected by the world’s soccer and journalistic associations. Despite all the titles he won – European champion, Olympic champion and many others – Lev Yashin was a very approachable man, devoid of any arrogance or haughtiness. Lev Yashin remains the only goalkeeper to have ever won the European Footballer of the Year award, the Ballon d'Or. This took place in 1963, a year after the World Cup in Chile, where the Soviet team failed to reach semi-finals and Soviet soccer officials blamed Yashin for the defeat. But he managed to come out of it undaunted and began to play even better, winning not only the "Golden Ball" but also a chocolate ball presented to him by French pastry chefs. Fifty years on, it turns out that the chocolate ball still survives – though Yashin's grandchildren have picked at its foundation a bit. This anecdote was shared by Yashin’s widow, Valentina Yashina, at a presentation of a new book about the great goalkeeper. Despite being over 80, Valentina Yashina has a phenomenal memory that preserves all the details of the life and career of "The Black Spider", as Yashin was nicknamed outside the USSR, so called for his trademark black jersey and his long arms, which could save almost any shot. The book about Yashin has been published as part of the long-established and respectable biography series called ZhZL (Life of Outstanding People), which was founded in the late 19th century. It publishes biographies of people who have left a mark in history, from Homer to Putin. It so happened that the presentation of Yashin's biography coincided with the news that during the 2014 World Cup in Rio de Janeiro, a monument to "The Black Spider" will be unveiled in the city. It will be an exact replica of the monument to Yashin erected outside the Dynamo stadium in Moscow. The Dynamo stadium is currently undergoing major repairs. Once the refurbishment is over, one of its stands will be named after the great goalkeeper, who spent his whole sporting career with the club, from 1949 to 1971. "Yashin was ahead of his time"
At the book launch, Dynamo soccer players past and present were united in saying that Yashin was a man ahead of his time. "I do not recall any other goalkeeper in history who had such an understanding and reading of the game,” recalls Vladimir Pilguy, who replaced Yashin as Dynamo keeper after the latter's retirement. “The moment the other side started an attack, Lev Yashin would instantly tell the defenders where they should be in the field. The fans always called Yashin by his first name. To them, he was one of them, like a brother or a friend. Soccer fans always walked him home, helping him to carry his heavy sports bag." Another goalkeeper, Oleg Ivanov, recalled how he once substituted Yashin in a game with SKA Odessa 20 minutes before the end of the match and let a scrappy goal in. Yashin, who was sitting behind the net and having a cigarette (it is a well-known fact that he was a heavy smoker and would have a cigarette even in the interval) told Ivanov: "Tomorrow we shall have a practice session." On the next day, despite having a day off after the game, Lev Yashin came to the Dynamo training base and spent several hours mentoring the young keeper. "Lev Yashin taught me that a great man should be generous of spirit and good-natured," said the former captain of the Russian national team and now an adviser to the president of FC Dynamo, Alexei Smertin. 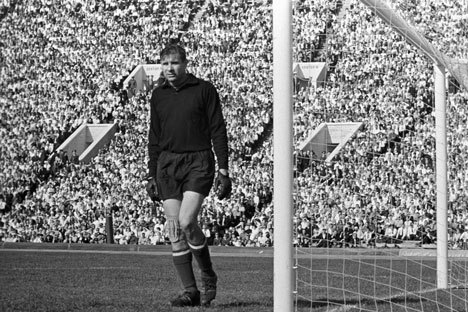 He recalled how, as a teenager, he went to a Dynamo match organized in 1989 to commemorate Lev Yashin's 60th birthday. "Lev Ivanovich, sitting in the stands, signed autographs to everybody who came up to him, even during the game itself. That lasted throughout both halves of the game but he did not refuse a single fan, although in theory he was there to enjoy the game,” he said. Yashin is as loved and admired now as he was 50 years ago. "Only Yashin, only Dynamo," is the refrain of a song sung to this day by Dynamo fans at matches to cheer on Yashin's successors.